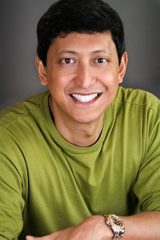 Comedy star, Dan Nainan, will perform double-duty at the Ball. He will introduce the performers on the main stage throughout the evening… then he’ll have the masses rolling as he performs a Late-night Comedy Show! Dan has entertained crowds all over the world. He has appeared on network television, in a feature film, on radio and in an Apple “Get a Mac” commercial. He has entertained Presidents and dignitaries, including President-elect Donald Trump. We look forward to his performance.